Looking for accommodation in Rhodes Island? Check out Luxury Holiday Villas in Rhodes Island! The best preserved medieval settlement in the world has joined the list of World Heritage Cities (World Heritage Towns) of UNESCO. 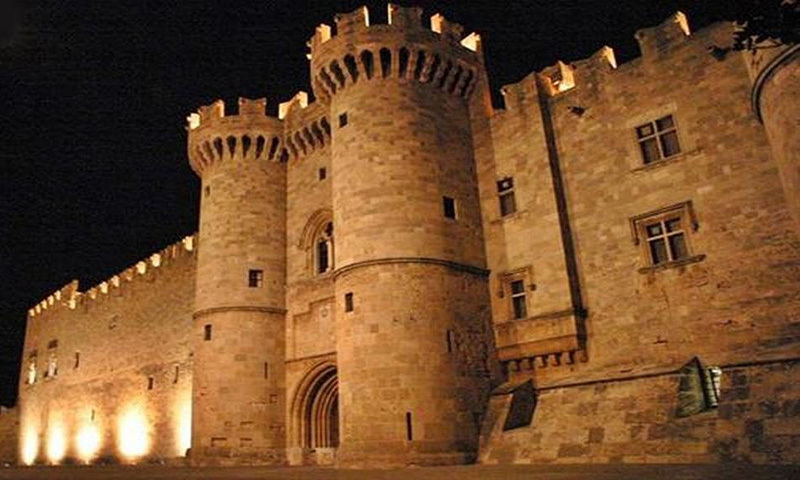 Protected inside its imposing walls of – between the past and the present – the Old Town of Rhodes is the “landmark” of the island, and one of the many reasons to choose Rhodes holidays this summer. In the Old Town, every stone is dated 2400 years ago. Visit the ancient statues, marble coats of arms, fountains, the Street of the Knights and the Palace of the Grand Master, mosques and hamams, the Clock Tower with incredible views. All these are the heritage left by the cultures that passed. The most famous street of the Old Town of Rhodes is the Street of the Knights, restored to the form it was in the Middle Ages. Here are the accommodations of ethnic groups that made up the Order of the Knights. At the highest point of the road stands the imposing Castelo, the Palace of the Grand Master, with its huge towers. It is a wonderful museum and one of the main attractions of the island. Mandraki is the modern city of Rhodes and its commercial center. There, you will find countless cafes, restaurants, clubs, and the traditional “marasiotika ‘homes. 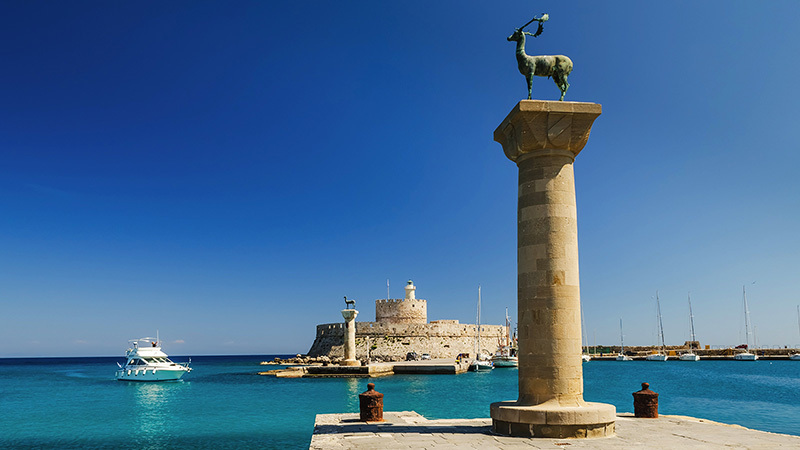 At the port of Mandraki, on two tall columns of limestone, are the symbols of the island: the elk and deer. At the edge of the pier of the harbor, stands the small fortress of St. Nicholas, built in 1464-1467. 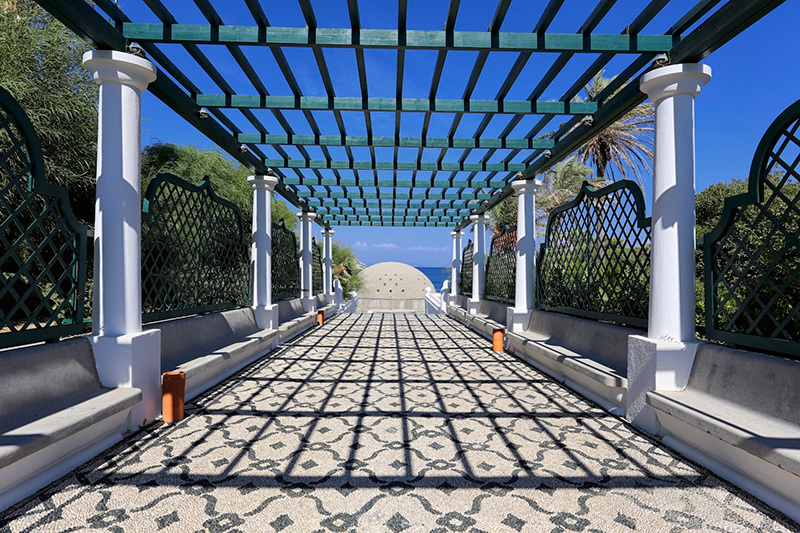 Along the coastal road of Mandraki, you will be impressed by the public buildings built by the Italians: the New Market, the Bank of Greece, the Government House, the Palace of the Archbishop, the Town Hall, the National Theatre and the famous Hotel des Roses (Grande Albergo Dell Rose ), one of the most luxurious in Europe. Today, a part of the hotel houses the Casino of Rhodes. In front of it lies “Enidrio” (= the Aquarium), one of the most cosmopolitan beaches of the city. It is the most popular sight you will see during Rhodes holidays! According to a tradition, Colossus, once, stood in the harbor of Rhodes. Ships were sailing under his feet and the passage closed in the evenings with a chain. It is one of the most impressive “stories” that you will hear while you are on the island! The ancient Acropolis of Lindos is one of the most popular religious centers of antiquity, surrounded by the walls of the Knights, standing at 116 m. above sea level. Here, you can admire the impressive Doric Temple of Athena Lindia, of the 4th century BC. The village of Lindos, built amphitheatrically on the hill, remains the most popular on the island. In summer, the streets are flooded with tourists. They visit bars and restaurants and make their shopping in the shops with souvenirs, local products and the famous decorative dishes. Rhodes holidays definitely require a visit to this traditional town. Faliraki is the most popular and favorite destination of young tourists, spending Rhodes holidays. This place is characterized by the intense emotions, the loud music and plenty of alcohol. It is also a paradise for lovers of adrenaline, featuring water sports, carting tracks, bungee jumping and one of the largest Aqua parks in the Mediterranean. In a lush canyon, about 1 km long., Is unique in Greece forest “solicited” trees like sycamores. The smell of their juice attracts millions of butterflies of the kind “Panaxia quadripunctaria”, with the characteristic four orange dots on each wing. It is a paradise on earth! Once you visit it, you should be really careful, in order not to scare the butterflies. Rhodes features another small, hidden paradise which reveals only to the nature lovers. This the Seven Springs, located 30 km. 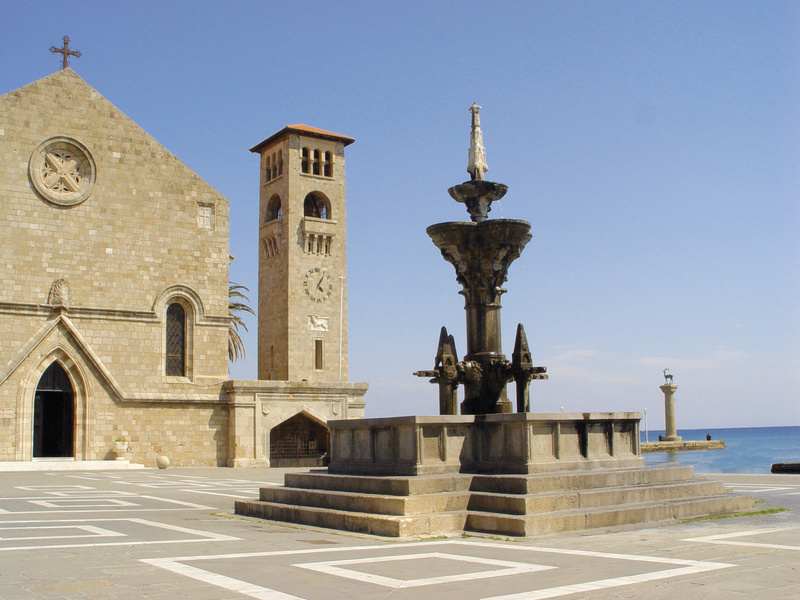 from the center of Rhodes Town. 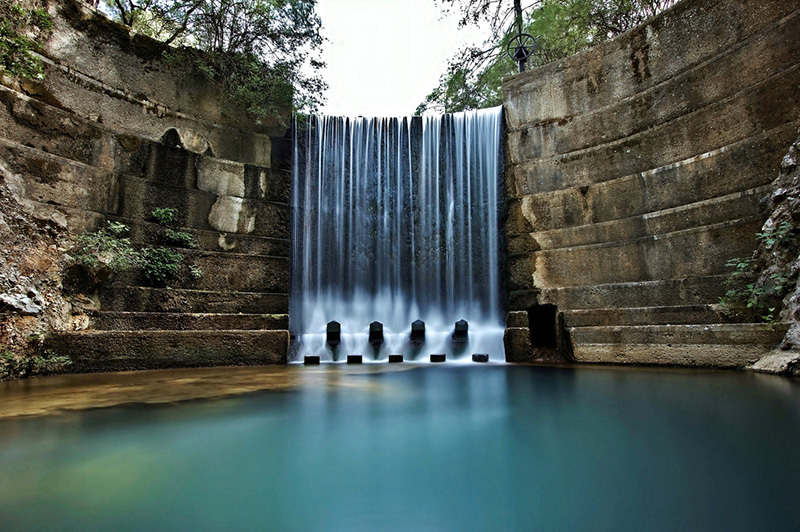 It is a beautiful setting with tall trees, which is named after the seven springs with cool running water. You will have the opportunity to experience moments of incredible relaxation. Do not forget to visit the lake in the region, after crossing the small narrow tunnel that passes through the area. Starting from the town of Rhodes and within 8 km., you will reach the old Bath facilities of Kallithea. The springs, with medicinal waters a few years ago attracted many patients. Now, they are not in operation, but it is worth seeing the Bath facilities and swim in the quiet bays. If you love the sea, Rhodes, with its countless beaches, is the ideal island for you: rare beauty and activities for all tastes are offered in its beaches: Kiotari, Kallithea, Agathi, Mavros Kavos, Kolibia, “Anthony Quinn” beach, Vliha, Afandou beach with a golf course, Traganou beach with its beautiful caves, Tsambika … All wonderful, sand, crystal clear water, infrastructure, water sports. The fans of windsurf love Prasonisi, a small wooded island in the south of Rhodes beach towards him.